Acclaimed by critics in the United States and abroad for performances of stunning virtuosity, refinement and communicative power, pianist Ya-Fei Chuang has appeared at international festivals include the Beethoven Festival in Warsaw with Christoph Eschenbach, Taipei International Music Festival, the European Music Festival(Stuttgart), , the Bach Festival in Leipzig, Schleswig-Holstein, , Ravinia, Sarasota, Gilmore, Tanglewood, the Celebrity Series in Boston, and the Oregon Bach Festival. She has appeared with the Spectrum Concerts in Berlin, at the Fromm Foundation concerts at Harvard, the American Academy of Arts and Sciences in Cambridge(USA), and at venues such as the Cologne and Berlin Philharmonic Halls, the Schauspielhaus Berlin, the Gewandhaus Leipzig, and Jordan and Symphony Halls in Boston. Ms. Chuang has performed as duo partner with Kim Kashkashian, Robert Levin, Steven Isserlis, and James Buswell. The Ruhr Piano Festival(Germany) has released two CDs of her performances there—her May 2007 solo recital, which was also distributed as a premium by the music magazine ‘Fono Forum’; and live performances of the Mendelssohn G-minor piano concerto and concerto for two pianos in A-flat. Her recent engagements include concerts and recordings in the Berlin Philharmonic Hall, with the City of Birmingham Symphony Orchestra, the Malaysian Philharmonic, appearances at the National Concert Hall Taipei, performances in England, Germany, Austria, South America and throughout the US. She has recorded solo, concerto and chamber music works for Naxos, Harmonia Mundi, ECM, New York Philomusica Records, and the Ruhr Piano Festival. Her recording of Hindemith’s chamber music works with Spectrum Berlin was awarded the special prize by the International Record Review 2009. Ya-Fei Chuang’s mastery of the most challenging solo and chamber repertoire is complemented by her commitment to contemporary music. She has given the world premieres of works by John Harbison, Stanley Walden and Thomas Oboe Lee. 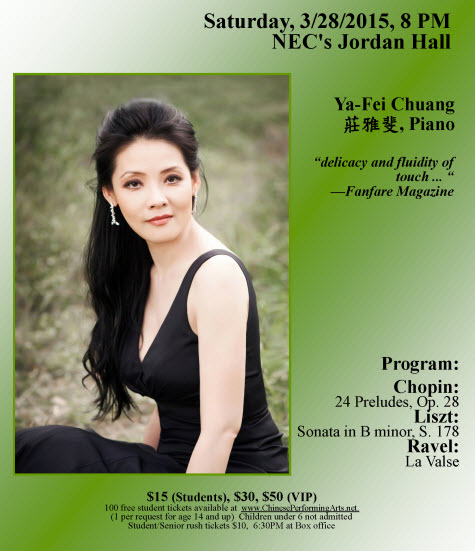 Ya-Fei Chuang is on the faculty of the Boston Conservatory and at the New England Conservatory Preparatory Division and SCE. She gives master classes throughout the US, Europe and Asia, including at the World Piano Pedagogy Conference, at Tanglewood, and annually at the International Summer Academy of the Mozarteum, Salzburg. Prizewinner in the Cologne International Piano Competition at age 18, Ya-Fei Chuang first performed on television in her native Taiwan at the age of eight and gave her first public recital at age nine. She won first prize at the nationally televised ‘Genius vs. Genius’ Competition at age ten and first prize at the National Competition(Taiwan) at age eleven. The following year she received unprecedented fellowships and scholarships from several prestigious foundations in Germany and Taiwan that enabled her to pursue pre-college, undergraduate, and masters-level studies at the Freiburg Conservatory(Musik-hochschule) with Rosa Sabater and Robert Levin, completing the six-year course of study in four. During this time she was awarded numerous prizes, including the Basel-Colmar-Freiburg Arts Prize and the Mendelssohn Prize in Freiburg. She subsequently concluded her German studies with Pavel Gililov, receiving a concert diploma(final degree) at the Cologne Conservatory, and earned a graduate diploma at the New England Conservatory in Boston, USA, with Russell Sherman. Acclaimed by critics worldwide for her virtuosity and refinement, Ms. Chuang was born in Taiwan and educated in Europe and US. Currently, she teaches at Boston Conservatory and the New England Conservatory Preparatory. 當晚曲目有蕭邦24首前奏曲，李斯特B小調奏鳴曲，及拉威爾的圓舞曲。精湛完善的技藝一氣喝 成。 全體觀眾多次起立, 熱烈掌聲久久不停。莊雅斐以蓋希文和舒伯特兩支安可曲，回應熱情觀眾。第二天波士頓音樂雜誌(Boston Musical Intelligencer)即刊出一篇對她大為讚賞評價極高的報導: "她的音樂與作曲家親密交流， 不僅展現出抒情的美，同時表現出多彩， 豐富，強大的 完美層面......令人驚嘆不已。"